Vatican City (AsiaNews) - Following the example of Jesus, who did not succumb to triumphalism in the face of the cheers of the crowd as he entered Jerusalem and faced with the Cross he maintained peace in his heart "a peace that is not detachment, it is not impassivity or superomism, but it is trustful abandonment to the Father ”. 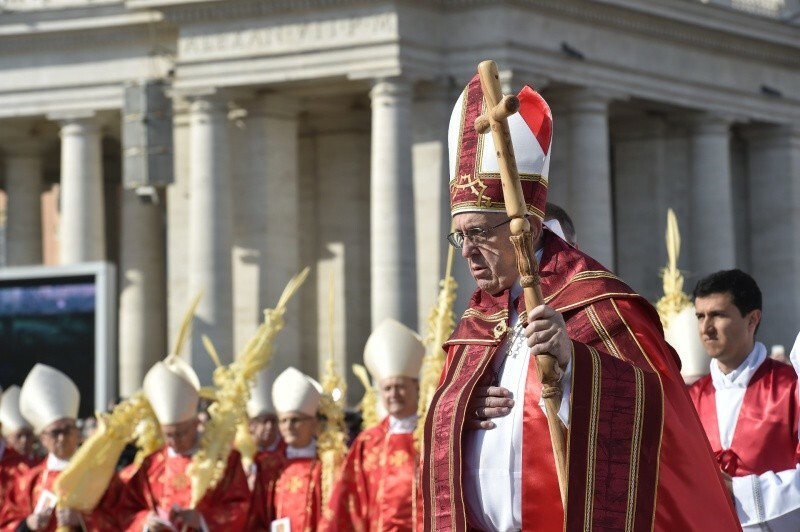 Palm Sunday, when the last moments of the life of Jesus were traced to the Gospel, gave Pope Francis the opportunity to invite the Messiah to follow "on the path of humility and obedience". A road indicated in particular to the many young people present in St. Peter's Square among the 50 thousand people who came for the celebration that Francis began in the center of the square, near the obelisk, where the He blessed palm trees and olive trees. Today is the 34th World Youth Day, on the theme: "I am the servant of the Lord. May it be done to me according to Your word” (Lk 1: 38). A day that is celebrated at the diocesan level and in fact in the square there were young people from Rome and other dioceses. For the occasion, Francis had a special "Rosary crown" distributed to those who gathered in St. Peter's Square. "These olive wood crowns - he explained before the recital of the Angelus - were made in the Holy Land expressly for the World Youth Meeting in Panama last January and for today. I therefore renew to the young people and to all my appeal to pray the Rosary for peace, especially for peace in the Holy Land and in the Middle East ". Referring to today's Gospel, during his homily Francis spoke of the "Joyful acclamations at Jesus’ entrance into Jerusalem, followed by his humiliation. Festive cries followed by brutal torture. This twofold mystery accompanies our entrance into Holy Week each year, as reflected in the two characteristic moments of today’s celebration: the initial procession with palm branches and the solemn reading of the Passion. Let us enter into this movement, guided by the Holy Spirit, and thus obtain the grace we sought in our opening prayer: to follow in faith our Saviour’s example of humility, to heed his lesson of patient suffering, and thus to merit a share in his victory over the spirit of evil." "Jesus shows us how to face moments of difficulty and the most insidious of temptations by preserving in our hearts a peace that is neither detachment nor superhuman impassivity, but confident abandonment to the Father and to his saving will, which bestows life and mercy. He shows us this kind of abandonment by spurning, at every point in his earthly ministry, the temptation to do things his way and not in complete obedience to the Father. From the experience of his forty days in the desert to the culmination of his Passion, Jesus rejects this temptation by his obedient trust in the Father." "Today, too, by his entrance into Jerusalem, he shows us the way. For in that event, the evil one, the prince of this world, had a card up his sleeve: the card of triumphalism. Yet the Lord responded by holding fast to his own way, the way of humility. Triumphalism tries to make it to the goal by shortcuts and false compromises. It wants to jump onto the carriage of the winner. It lives off gestures and words that are not forged in the crucible of the cross; it grows by looking askance at others and constantly judging them inferior, wanting, failures... One subtle form of triumphalism is spiritual worldliness, which represents the greatest danger, the most treacherous temptation threatening the Church (De Lubac). Jesus destroyed triumphalism by his Passion." "The Lord truly rejoiced with the people, with those young people who shouted out his name and acclaimed him as King and Messiah. His heart was gladdened to see the enthusiasm and excitement of the poor of Israel. So much so, that, to those Pharisees who asked him to rebuke his disciples for their scandalous acclamations, he replied: “If these were silent, the very stones would cry out” (Lk 19:40). Humility does not mean denying reality: Jesus really is the Messiah, the King." "Yet at the same time the heart of Jesus was moving on another track, on the sacred path known to him and the Father alone: the path that leads from “the form of God” to “the form of a servant”, the path of self-abasement born of obedience “unto death, even death on a cross” (Phil 2:6-8). He knows that true triumph involves making room for God and that the only way to do that is by stripping oneself, by self-emptying. To remain silent, to pray, to accept humiliation. There is no negotiating with the cross: one either embraces it or rejects it. By his self-abasement, Jesus wanted to open up to us the path of faith and to precede us on that path." "The first to follow him on that path was his mother, Mary, the first disciple. The Blessed Virgin and the saints had to suffer in walking the path of faith and obedience to God’s will. Responding with faith to the harsh and painful events of life entails “a particular heaviness of heart (cf. Redemptoris Mater, 17). The night of faith. Yet only from that night do we see the dawn of the resurrection break forth. At the foot of the cross, Mary thought once more of the words that the angel had spoken about her Son: “He will be great… The Lord God will give him the throne of his father David, and he will reign over the house of Jacob forever, and of his kingdom there will be no end” (Lk 1:32-33). On Golgotha, Mary faced the complete denial of that promise: her Son was dying on a cross like a criminal. In this way, triumphalism, destroyed by the abasement of Jesus, was likewise destroyed in the heart of his Mother. Both kept silent." "In the footsteps of Mary, countless holy men and women have followed Jesus on the path of humility and obedience. Today, World Youth Day, I would like to mention all those young saints, especially the saints “next door” to us, known only to God; sometimes he likes to surprise us with them. Dear young people, do not be ashamed to show your enthusiasm for Jesus, to shout out that he is alive and that he is your life. Yet at the same time, do not be afraid to follow him on the way of the cross. When you hear that he is asking you to renounce yourselves, to let yourselves be stripped of every security, and to entrust yourselves completely to our Father in heaven, then rejoice and exult! You are on the path of the kingdom of God."